Born on 6 September 1873 in Guildford, Surrey, England - nephew of James Beddoe, Guildford, Surrey, England - at the time of his enlistment in 1915: trade as labourer; widower (one child); no current or previous military service; Church of England; height of 5 feet 4 inches; chest of 38 inches fully expanded; ruddy complexion; blue eyes; light brown hair. 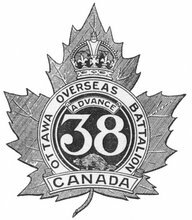 Joined the 38th Battalion, CEF, in Alexandria, Ontario, on 12 February 1915 (number 410638) - transferred to the 2nd Battalion, CEF, on 25 August 1915 - killed in action on 21 September 1916 - name inscribed on the Vimy Memorial, France. (Updated with a photo of Pte Welch's inscription on the Vimy Memorial that I took in August 2012). Just a Canadian military historian trying to make his way through the twists and turns of his craft. Surnames (first letter only), Etc. This work is licensed under a Creative Commons Attribution-NoDerivs 2.5 License.